I can’t believe this is happening to me, but I’m getting bit by the turning bug and it’s obvious it’s contagious! 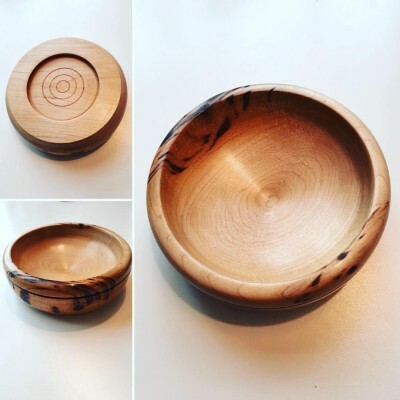 Woodturning is a slippery slope! Now that my time in the shop is currently less than it use to be, I really want to be able to knock out a project or two from start to finish, and the lathe is probably one of the one tools where this is entirely possible. In today’s episode I’m literally turning some scrap maple into a small bowl. What’ll I use it for? Probably to hold keys, or spare change, or more likely M&M’s! I love turning but haven’t begun to get good at it. I turned a dowel over the week end. ( I hope to turn it into a fluted column for another project). I bought the carbide tools from Harrison Specialties. It is a hassle to change the handle but was significantly cheaper. If it wasn’t for the carbide gouges I probably would have given up already. Bob some traditional turners get really bent out of shape at the idea of using the carbide tools, but I say if it gets you in the game that’s all that matters. Otherwise, I’d probably not be in front of the lathe as often either LOL! never use a tool on the up turning side of the wood the wood has to always be turning down to keep the tool on the rest. learn before you show the WRONG and dangerous way of doing things. Yes Garry, I’ve since learned this fact and will be demonstrating it in future episodes. Thankfully nothing happened, but we learn and share through our mistakes. I’ve never hidden that fact from my audience. So I’ll continue to share and correct as needed, even as I’m beginning to learn myself. Nice video and yep wood turning is a lot of fun. Congrats on the nice looking bowl you made. One of the quick finishes I use is lacquer which I buy by the gallon and mix it with about 4 parts lacquer thinner to 1 approximately. I store the mix in a glass whisky bottle. To use I just dampen a rag a little at a time straight from the bottle and wipe it on. Thank you for sharing also. I’ll have to give it a try. Why create a tenon on one side, merely to flip the blank around and create a second tenon on the opposite side and then flip the blank again?? You could have created a single tenon while the blank was mounted on the screw chuck, reversed this and then turned the inside of the bowl. Also your tenons should be smaller, just a bit larger than the jaws of the chuck. With all the excellent turning videos already available on YouTube, your instructional turning videos might be tempered until you have achieved a greater degree of personal expertise. I am certain that you will achieve this and I have enjoyed your woodworking projects in the past. Hey Andy thanks for watching. Certainly without a doubt my turning videos will be cringe-worthy to watch for others who already have some time at the lathe under their belts. But in the very short time since I made this first bowl, it’s crazy how much I’ve started to figure out on my own LOL! Many more improvements, AND lessons for me to come LOL! I’m not a turner but am considering giving it a try. I greatly appreciate watching you learn the craft. It’s actually more fun to watch you learn than to watch some turning master. I’m sure you are making the same mistakes I will make when I start to learn. I appreciate you pointing out those mistakes so I can be forewarned. Great video, thanks! Thanks for watching! I really appreciate it.